Bladder stones in dogs, also called uroliths, are a fairly common problem that most dog owners will face at some point. They’re caused by a buildup of certain minerals in your dog’s bladder, and while they may present with similar symptoms to bladder infections in dogs, they have very different treatments. It is important that you understand the variations in bladder stones, and that each variation requires a different type of treatment. There are three different types of bladder stones in dogs: struvate stones, urate stones, and calcium oxalate stones. Some struvate stones and most urate stones can be cleared up with antibiotics and a special diet, but calcium oxalate stones will almost never dissolve and will therefore require surgery for removal. Bladder stones are one of the many dog incontinence causes, and will undoubtedly cause your canine friend a lot of pain, especially if left untreated. Under no circumstances should you ignore bladder stones or try unproven home remedies in the hope that the stones will just go away. Similar to urinary tract infection in dogs, the problem of bladder stones may start out small, but can grow to a point where your dog will not be able to urinate at all. 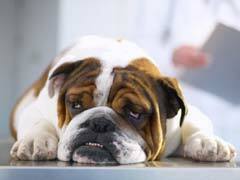 At this point, bladder stones in dogs are very dangerous and could lead to death. If your dog is unfortunate enough to have the calcium oxalate variety, then surgery will inevitably be required. Surgery may involve reaching and crushing the stones, if they are not too large, with specialized medical tools and no incisions. Otherwise, if the bladder stones in dogs are too large to crush, an incision must be made in the bladder to allow for removal. Following surgery, a special prescription diet is required to ensure bladder stones in dogs don’t return. Even if your vet assures you the stones are completely dissolved, it is advisable that you keep your dog on its prescription diet for the remainder of its lifetime. Dog bladder stones, human bladder stones and cat bladder stones are all the same in that way: they tend to come back if you don’t take precautionary measure.